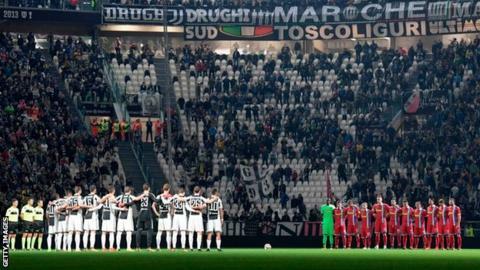 Some Juventus fans turned their backs and sang the Italian national anthem during a minute's silence to remember the Holocaust before the Serie A game against SPAL. A passage of Anne Frank's diary was read before Wednesday's matches, after an anti-Semitic incident at Lazio on Sunday. At most stadiums the minute's silence turned into applause. But some fans at Roma-Crotone drowned out the reading with team chants. On Sunday at Rome's Olympic Stadium a section of Lazio fans known as the "ultras" - known for their racist chants and often violent behaviour - left stickers of Holocaust victim Frank in a Roma jersey alongside anti-Semitic slogans such as "Roma fans are Jews". Italian president Sergio Mattarella called the case "alarming" and Italian police have opened an investigation. On Wednesday, Lazio players warmed up for their 2-1 win at Bologna in jerseys with an image of Frank and the words "No to anti-Semitism". Frank became one of the most famous Jewish victims of the Holocaust after her diary of her life as a German Jew in Nazi-occupied Amsterdam in World War Two was published in 1947. She died at Bergen-Belsen concentration camp when she was 15 years old. Juventus beat SPAL 4-1, while Roma 1-0 against Crotone. Lazio players warmed up in T-shirts which read "No to anti-Semitism"